Generation Y. Millennial Generation. Generation Me. Peter Pan Generation. These are all terms that describe the generation to which I belong, but I can’t say I like many of them. Generation Me? Peter Pan Generation? That certainly doesn’t make me feel like a valued employee or team player, which I strive to be. Traditionals—born before 1945, loyal workers, highly dedicated, but may have difficulties with ambiguity and change. Baby Boomers—born between 1946 and 1964, believe that hard work and sacrifice are the price to pay for success, but may be technically challenged and expect to have authority. Generation X’ers—born between 1968 and 1979 (which leaves some room for interpretation, with the 4 year gap from the last generation), like to receive feedback, aspire to achieve a balance between work and life, but have been labeled the ‘slacker’ generation. Generation Y’ers—born between 1978 and 1995 (though the end of this generation is still undetermined), are confident multi-taskers, but have been characterized as demanding. Whether you are a new administrator coming into a program with a wide range of generations or a teacher who works alongside others of different generations, it can be a complex dynamic within the child care program. That new Generation X administrator may struggle with establishing authority with her subordinates in the Baby Boomer generation. Veteran Traditional generation teachers may need to figure out how to work together with the newcomer from Generation Y. Or, just like me, those employees balk at the labels of their generation and you find that working together isn’t as challenging as you predicted. If you would like to find out more about working with various generations, 4C is holding its First Annual Leadership Conference in the Miami Valley on April 19, 2013. A session will be provided on leading and motivating multi-generations, among many other great session topics. Look for registration coming soon on our Web site! I’ll leave you with a quote I found from the book Change the World for a Fiver: “Talk to old people. They know cool stuff you don’t. Talk to young people. 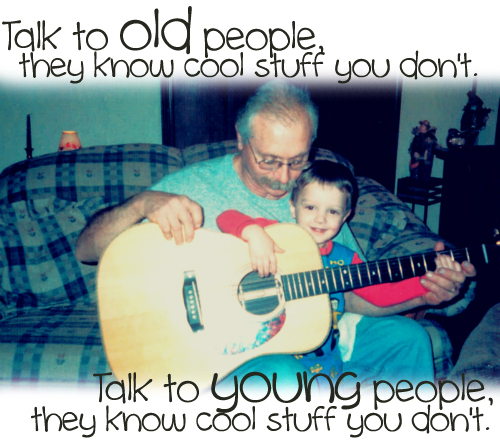 They know cool stuff you don’t.” What have you learned from someone older or younger? This entry was posted in Directors & Administrators, Professional Development and tagged early childhood, generation gap, teachers on March 1, 2013 by Janine Rigg.